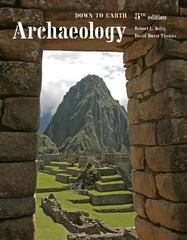 Archaeology 5 Edition This new brief edition pairs two of archaeology's most recognized names -- David Hurst Thomas of the American Museum of Natural History and Robert L. Kelly of the University of Wyoming. Their well-chosen examples show how archaeologists have worked through actual problems in the field and in the lab. After using this book, readers will be better able to ask questions, solve problems, and discern "truth" from "fiction." They will learn about the nature of archaeological data and how archaeologists do such things as archaeological survey and excavation. They also will develop their sense of scientific logic and gain a better understanding of career opportunities available to archaeologists. This edition's enhanced full-color design improves the visual presentation and enables users to more clearly see the key points of an image. A rich array of supplemental resources includes a new companion website, as well as the option to use the Doing Fieldwork: Archaeological Demonstrations CD-ROM, Version 2.0, also developed by the authors. Available with InfoTrac Student Collections http://gocengage.com/infotrac.